This page contains all the Petals & Patches Seaside Moments patterns available for you to purchase. Some of these quilts are visible in greater detail. Place your mouse over a quilt to see if this extra detail is available. All patterns can be purchased via our secure shopping cart, or alternatively you can mail your order to us. We ship your order via surface mail within Australia or airmail outside Australia. You can review the contents of your cart with the Review Cart button near the bottom of this page. 3. 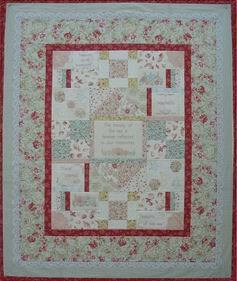 $85 for the complete quilt pattern if paid upfront, with pencils & antique Swiss lace. 4. New row pattern monthly including pencils and lace. The following charges will apply to the 1st and 6th months - $21 ea. 2nd to 5th months - $11 ea. For a total of $86. 3. Seaside quilt with pencils & antique Swiss lace. 4. Seaside quilt with pencils & antique Swiss lace, charged monthly as noted in the price column. The monthly amounts will be charged to your account when posted. Postage & handling costs are not included and will be added to the bill. Design size : 150cm x 126cm (59" x 49�"). 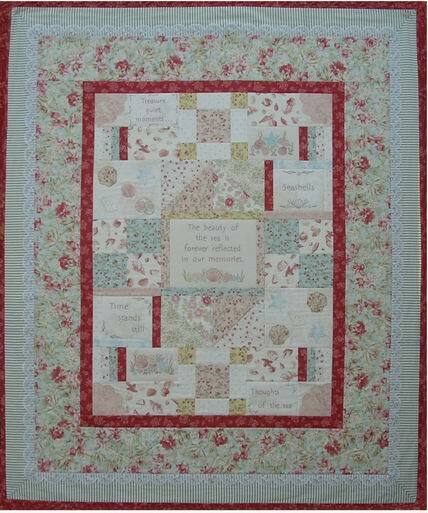 The inspiration for this quilt was the fond memories as a child collecting seashells from our beautiful Australian beaches and it uses some of the "Seaside Rose" range of fabrics. The quilt features inserts of colour washed seashell pictures using watercolour pencils, hand appliquè, embroidery and a border highlighted with antique Swiss embroidered lace. It is suitable as a topper for either a single or double bed and is suitable for beginners to advanced as it uses basic sewing skills. Design size : 55cm x 18cm in diameter (21¾" x 7"). The inspiration for this bolster cushion was the fond memories as a child collecting seashells from our beautiful Australian beaches and it uses some of the "Seaside Rose" range of fabrics. 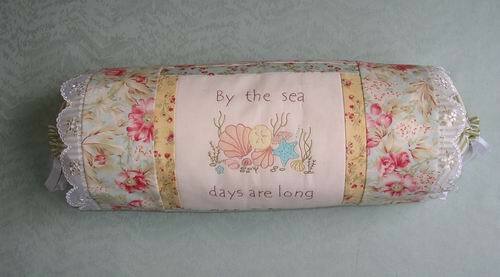 It can be a standalone cushion on a bed or a wonderful accompaniment to the Seaside Moments Quilt (SM01). The Seaside Moments Table Runner (SM03) and Seaside Moments Cushion Set (SM04) are others in this range. Design size : 85cm x 44cm (33�" x 17�"). The inspiration for this table runner was the fond memories as a child collecting seashells from our beautiful Australian beaches and it uses some of the "Seaside Rose" range of fabrics. 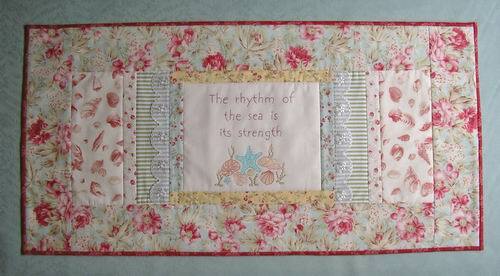 It can be a standalone table runner or a wonderful accompaniment to the Seaside Moments Quilt (SM01). 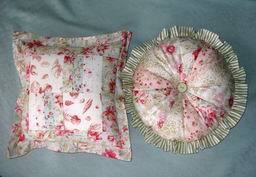 The Seaside Moments Bolster Cushion (SM02) and Seaside Moments Cushion Set (SM04) are others in this range. Square - 40cm x 40cm (16" x 16"). Circle - 40cm diameter (16"). 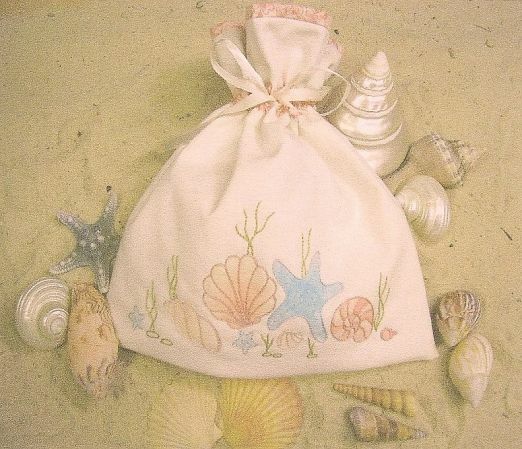 The inspiration for this cushion set was the fond memories as a child collecting seashells from our beautiful Australian beaches and it uses some of the "Seaside Rose" range of fabrics. It can be a standalone cushion set or a wonderful accompaniment to the Seaside Moments Quilt (SM01). The Seaside Moments Bolster Cushion (SM02) and Seaside Moments Table Runner (SM03) are others in this range. Size : 24cm x 24cm (9½" x 9½") approx. This small drawstring bag features colour washed seashell pictures using waterclour pencils and simple embroidery stitches. This pattern is suitable for beginners or advanced as it uses basic sewing skills.